Last Friday DH together with his group joined the school's creative cooking competition for the Linggo ng Wika celebration. Early in the morning his co-members (all girls) came to the house and started to cook their entry for the day. It's Tulya con carne in Milk sauce. Well to give you an idea the ingredients are tulya shells, ground pork, pineapple chunks & juice, coconut milk, 7-up or sprite, chili and spices. Tomatoes and green leafy veggies are just trimmings here. I've assisted them in the end to give the final kick to the food ..I mean to add flavor and chili :-). If you'll ask the taste I can proudly say it's super yummy and has a different exotic taste because of the shells and sprite. It's easy to cook this- you'll only saute the ginger, garlic and onions. Then add the ground pork and cook it for about 15 minutes before adding the pre-boiled shells. Then it's turn for the Sprite or 7-up and coconut milk, after boiling the last ingredients added you can pour the chunks and juice of pineapple. Add seasoning, salt and black pepper in the process. Put desired chili in the end. Wait until the coco milk turned to almost oil form before putting off the fire. By the way they got the second prize out of 31 participants. The first prized menu is almost the same. 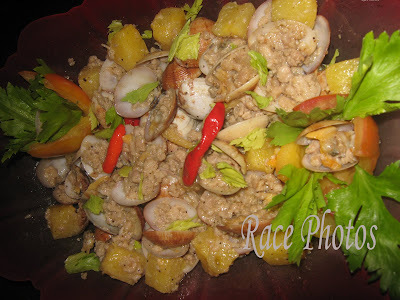 They used Tahong shells instead of Tulya. For other yummy entries just click the badges above! Warning/Reminder: If your stomach is somewhat weak try to avoid mixing coco milk with pineapple juice, though you can add the chunks. I think the combination of coco milk, pineapple juice and sprite is not that stomach-friendly so get rid of the juice. Congrats! very creative yung recipe nila.